Gold frogs in pre-Hispanic cultures were symbols of fertility and long life. The larger frog is about 3″ in length. This entry was posted in Treasures Bold and tagged frogs, inside the chest, Treasures Bold by dal. Bookmark the permalink. OMG!!! I love those frogs! Thanks Forrest and Dal for posting the pics of them! Amazing how much we prize nature without even realizing it. Art. Whoa! I nearly jumped put of my seat at the sight of these images. The 3″ frog is, indeed, my favorite! Thank you f and Dal. Thank you. Did the ancient artistisan pour gold into a mold for the frogs? What were molds made of? Curious about the process. Thanks Forrest and Dal for this bonus round of interesting vignettes. My husband works with metals he said they probably would use a sand casting method. Interesting, I can see the connection to fertility. Frogs lay a lot of eggs. Mising the connection to long life though. That is one big gold frog! Amazing piece of art. Wouldn’t that look nice on an office desk…Is spring here yet? This Quest keeps getting more interesting by the day. Most hidden treasures don’t come with their very own preview of contents. The drool factor keeps increasing…Playing with frogs as a child(we lived on a lake) was normal. Heck, I even had names for them. Never had any Gold ones though. The one on the necklace is very interesting. I have got to quit going to bed. What a site to wake up too! Takes my breath away………now I have to go back to bed…….I’m feeling faint. Beautiful! Funny BW……I feel the same……..these mornings remind me of Christmas mornings….I love them! Sailors also believed that frogs were good luck. It meant the water was good. Mark J. – an interesting bit about sailors and good luck frogs. Would the reference be to sailors of old coming onto land looking for fresh drinking water, or sailing inland waterways? My daughter loves frogs. One time we were down the road collecting frogs and polliwogs to bring home to her pond, and I spotted a coyote in the meadow above us. Now, I’ve always been easy to spook, and have a WILD imagination. The coyote was far to see and had a black snout, odd to see one here in the day so my mind immediately made it’s radical determination. ” Chupacabra”! I yelled in fear (some mom I am). She threw her coffee can full of polliwogs and water in the air and bolted for the truck, me right behind her. We got in, slammed the doors behind us and breathing very heavily in the silent truck, and she says. “My poor polliwogs.” !!! Funny! Thanks for triggering a fond and funny memory forrest! She’s off to college now, but we have a lot of frogs! It appears as though something was blacked out on the right side of the photo……. Is this the Tairona and Sinu Indian necklace described in the book? If so, then perhaps the Jaguar Claw was omitted from the photo? Why? Jason, I believe f wrote in TTOTC treasure chapter that the Tirona Sinu necklace had 39 animal fetishes including the jaguar claw. Other references I found containing drawings show that shape of necklace to be more of a torque than single strand. Thanks for that info, 42! The beads in this photo certainly don’t look like animal fetishes carved from jadeite, carnelian, or quartz so I guess this is a different necklace than the Tairona and Sinu one described in the book. Regardless, the photo appears to omit something on the right-hand side…….. the terminal ends of the necklace seem to be enveloped in a darker black color than the rest of the background……..
@ Jason, you’re right about something blacked out and doubly right – many things about TOTC and ff are curious. Loving the mystery of it all, but never certain if it’s marketing ploys to keep the game alive or something more, hidden beneath the surface of ff’s purpose in hiding the chest and keeping his secret – which in my opinion are two diff things. Anyway, life’s never dull if you check Dals and Jenny’s websites. They both do an awesome job!! Nice catch. It doesn’t seem to just run off the pic or the border of the pic. but deliberately removed, or as you said “blacked out”. makes one wonder if it was done before on the original pic or now in the showing of the pic. Are you a distant relative of Sherlock Holmes? Good to see you’re still around, Seeker! The large frog also appears to have sharp angular blacked-out areas around it…… on the body below the right eye for example….. also the left arm looks unusual…… more like a flipper! (obscure Ron White reference) Almost as if someone blacked out whatever the frog was resting on? If so, then why? After you mentioned the abrupt ending of the necklace, I did noticed the Larger frogs left arm. Benn looking for other pics to compare. As I recall from memory the arm was full… for lack of a better term. Has far as the blackness if the back ground, it could be an optical allusion or a photo-shop. Interesting all the same. but does it mean anything? I doubt it. And I’m not round… it’s just baby fat. That’s my story and I’m sticking with it!!! LOL. I picked that up yesterday, but if you look a bit closer, you’ll see that the background behind the frogs has been filled in as well. Not the best job, but certainly it took a lot of effort to fill in close to the frogs. Look closely (magnify) the picture and you see the strokes. Beauty is in the eye of the beholder. These frogs are childlike in their composition by modern standards of detail but very worthy of being cast in a precious metal such as gold. I never knew History could be so interesting! Frogs…humm…K.I.S.S… Could it be a reference to keeping it simple in solves, or a child’s game of leap frog with ‘she’ leaping in front of the other frogs? I had a t-shirt with this print back in junior high school. I loved that shirt. And fried in oil with a little salt…frogs are some gooooood eatin’. 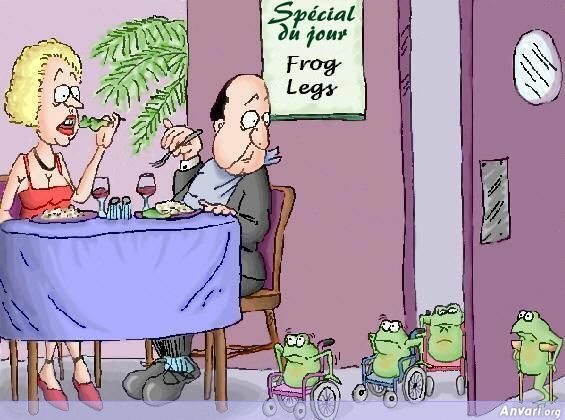 I mean, if you don’t have a problem eating fish…why would you have a problem eating frogs? Honestly. Fish love eating frogs…so technically you’ve probably eaten a lot of frogs anyway. Thank you for that Deb. I like it. Ribbit. 🙂 Leaping to conclusions..
Oh the pains of growing up, with predators everywhere, stopping anywhere is a dangerous proposition. Frogs have always peaked my interest as far back as a I can remember. I’d pull them out of their little Lilly pond hidding spots and place them in a glass jar and watch them for hours. What is it about the frog that we should know? The frog needs to be returned to the Lilly pond? I still love the picture of the frogs…three inches of golden frog…love it. I was reading back through some of these earlier threads and noticed the references to folks looking at the photos and trying to read things into it…and wondering about hidden meanings in the pictures. The style and composition of this picture…lighting etc…looks about the same as more recent ones. That golden frog is different looking than the one in the chest, but very similar; the obvious difference is that this one has the top crossbar to attach a necklace. Anyway, it seems likely they’re from the same culture and time period, and perhaps these artifacts were circulating around widely in Central America and Columbia. There is a gold frog in the chest. Thanks for the reminder.